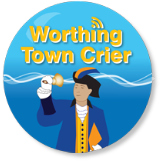 Whatever your function or event Bob Smytherman the Worthing Town Crier can add something special to ensure any occasion is even more memorable. Bob is available for events, fêtes, festivals, functions and parades. 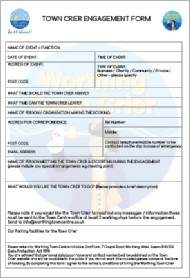 For registered charities and community groups in Worthing there is a charge of £20 (inc VAT), this covers travel expenses and administration costs. 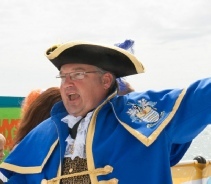 If the event requires Town Crier services for over 2 hours then an additional charge of £40 per hour will be payable. 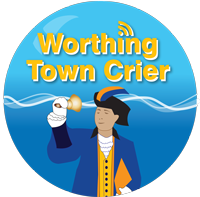 For events that are free for the public to attend and also raise the profile of Worthing the fee may be waived as long as free parking is provided. A wakeup call for the bride and groom, a proclamation at the wedding ceremony, or an introduction for each of the wedding speeches are among the services on offer. A Town Crier in full regalia is a great addition to any wedding. 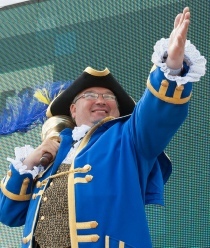 For a unique way to deliver a corporate message, launch a new product or service, or open a new premises a Town Crier can add some colour and ceremony to the proceedings. Messages of congratulations and good luck can be delivered for any celebration. 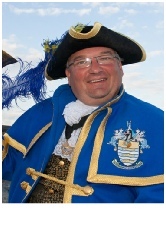 Bob can come along in full Town Crier regalia to open an event, pass on best wishes, introduce guests or be a master of ceremonies and keep everything running to time. 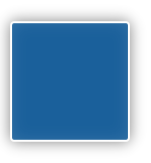 Reasonable travel expenses are included in the charges but if parking is not provided and is chargeable or the booking is more than 7 miles from Worthing additional travel expenses to cover these costs will be payable. These will be calculated and advised for approval before the confirmation of the booking. See the Printer Version Booking Form Below !